Cheie tubulara pentru diferential Camion BENZ- MAN, ZR-36RNSMBD - ZIMBER-TOOLS. Cheie tubulara pentru diferential Camion BENZ- MAN, ZR-36RNSMBD - ZIMBER-TOOLS.MAN & BENZ Differential Rear Nut Socket,Teeth: 6.Application range: MAN , Mercedes Benz Truck.Size: 101mm(I.D) x 6 teeth x 8.7mm width tooth.Inner diameter tooth to tooth: 113mm.Inner diameter side to side: 126mm.To remove the differential rear nut.High accuracy of fit.Six sided drive.Flat oval form. 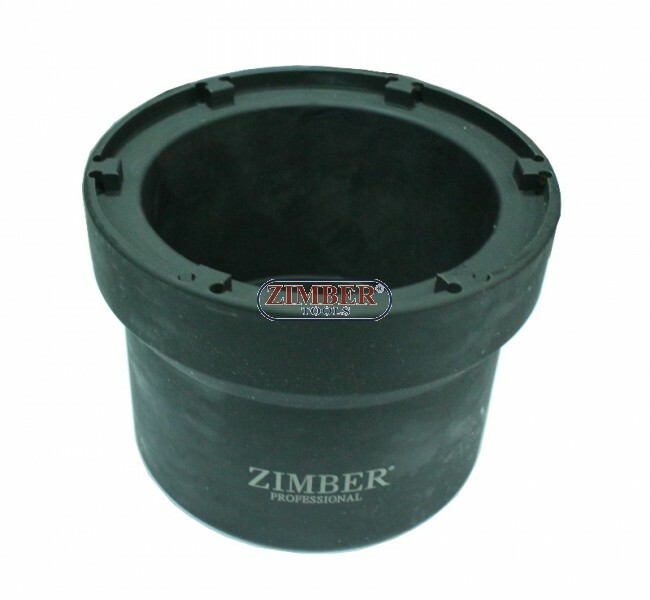 MAN & BENZ Differential Rear Nut Socket,Teeth: 6, ZR-36RNSMBD - ZIMBER-TOOLS. Application range: MAN , Mercedes Benz Truck. Inner diameter tooth to tooth: 113mm. Inner diameter side to side: 126mm. To remove the differential rear nut.